Trailblazer Alarik Lehtimäki started his bus in 1932. He used a 14 seat Chevrolet, or Letukka, as it was called, to transport his clients. The first bus routes ran from Lahti market place to Möysä and Niemi. 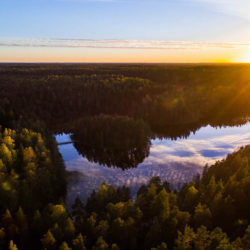 For a long time he also drove in Laune and to Isosaari via Kukkila. A special company Lahden Liikenne OY was established in 1950 to operate city transport in Lahti. Alarik Lehtimäki had ¼ ownership in the business. He became CEO on 1.11.1950. 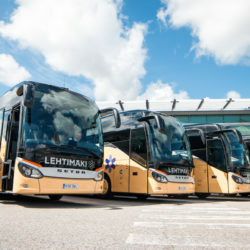 Private carriers gave their vehicles to company’s disposal and Alarik Lehtimäki had the greatest number of buses – 13. Nastola grew vigorously as a result of expanding industry and factories and the demand for public transport was constantly high. In 1968 the business was reorganized into a public limited company Lehtimäen Liikenne Oy and the next year – in 1969 – own car depot was built in Nastola. Public transport to Nastola was privately organized and in the early 1970’s the collection of fares by drivers was introduced, indicated by a letter E against orange background on the vehicle. The first bus with a middle door was taken into service in 1971. Back in the 1980’s, charters could only be operated with the number of buses equal to those used for public transport, which is why the number of buses stayed around 20 all through the decade. In 1995 – same time Lahden Liikenne Oy was sold – the buses started taking commuters from Nastola to Central Hospital and Hollola via Lahti. The line proved popular and passenger numbers went up. In 1995 charter licenses were released and the company immediately invested in charters. 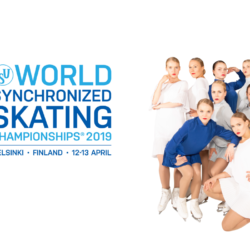 Ownership of the company went over to the Leo Lehtimäki family. 2000’s saw great expansion and renewal of the fleet. Low floor vehicles were introduced in public transport, charter business was expanded on a large scale, the overall number of vehicles went up and many buses were replaced with modern ones. Contained growth of the group has continued; a new depot was built in 2010 in Helsinki. 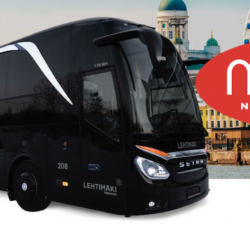 By the end of 2012 the company operated 44 buses and had own travel agencies in Lahti and Nastola and depots in Helsinki and Nastola. In 2012 a uniform corporate look was introduced.